A simple story can still be interesting if the plot is executed nicely, and the story of the characters engages the reader. Love stories even more so. In India, though love marriages do happen, arranged marriages still rule the roost. I'll start by applauding the cover design, which is quite grand, like a wedding. This story is of a marriage, where the characters Mili and Ahaan meet after years, slowly fall in love with each other and then get married. The story doesn't have any big twists and turns and flows well. The descriptions are appealing, and does its part to make it easy to imagine the setting. There is something to like about each character, but that seems to be balanced by some things that don't quite feel enjoyable. Mili's character is fun. She's portrayed as a bubbly girl, with ambitions in a field that's not quite usual. She's a loving daughter as well. Somehow, there's a mystery to her too, and one that could have been a good platform to make the story much more interesting. Instead, the character doesn't get a complete makeover, and feels incomplete. While her dialogues and insecurities feel realistic, they also go beyond a level where the character begins to irk me, and tempts me to skip in between. Ahaan remembers Mili and falls in love with her at first sight, even before meeting her in person. His character feels sweet and determined too, and even at the end, the prince charming who comes gallantly to the rescue. But other than his love, true as it seems, for Mili, not much is revealed of him. Plot lines that begin for the other smaller characters also feel like they are left open, which is a shame as their characters were interesting too. The parents who want the best for their child, but aren't that forceful when it comes to their vision of her future. The friends who support her, and the story that runs in that small town. The plans the couple have for after marriage. I didn't finish the story in one sitting, as I thought I would, but it did keep me engaged. 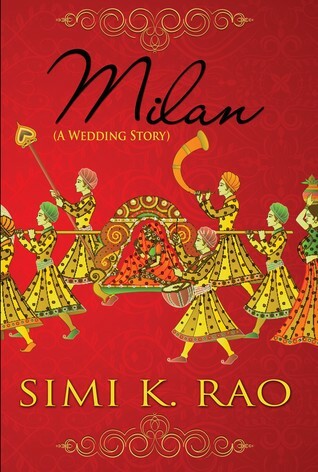 Milan is a wedding story. I can't help but wonder if we might see a sequel that reveals more of Mili's life post marriage, and closes those threads that are still open and make me curious to know about them. I rate it 3 stars.